Happy Monday lovebugs!! Now that awards season is in full swing, there's always couture to catch up on! Over the weekend the SAG Awards and Critics Choice Awards took place, and here are some of my favorite looks from the red carpet. Let me know your favorites!! Lupita Nyong'o is on fashion fire ladies and gentlemen. Here she is at the SAG Awards in a gorgeous, turquoise Gucci column dress with Fred Leighton jewelry. She is just perfection. Amy Adams is wearing a stunning dark blue, asymmetrical Antonio Bernardo gown with Cartier jewelry. Very couture. Sandra Bullock looked every bit the Oscar winner in this beautiful, emerald Lanvin dress adorned with Fred Leighton jewelry. 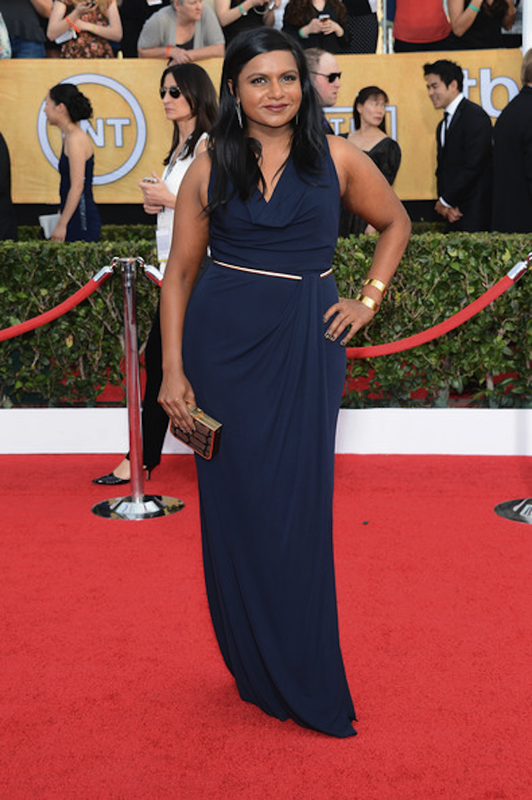 Mindy Kaling is beautiful in this deep navy David Meister dress, which perfectly flattered her silhouette. I mean, really, are you even surprised that she's on here twice?? Lupita Nyong'o owned the red carpet at the Critic's Choice awards in this white, cutout Calvin Klein gown.She and her stylist are killing it! I would love to see her helm a major fashion campaign next season, such as for Louis Vuitton. American Hustle actress Elisabeth Rohm was flawless in this cream colored Marchesa gown with Martin Katz jewelry. Absolutely beautiful. While not everyone may be a fan of this Pamela Roland dress on Sarah Hyland, I love the soft color and delicate cut. She looked youthful and balletic. Her Lorraine Schwartz jewels furthered her look and glow for the evening! Which looks were your favorites? I'd love to know!